View the Bonesville Mobile Alpha version of this page. It was just two seasons ago when East Carolina fans were up in arms about a defense that seemingly excelled at futility. That season, while the offense was setting school record after school record, the defense was wrought with injuries to an already young unit and the results were not pretty. In fact, the Pirates finished dead last in total defense in 2010 and many in the Pirate Nation didn’t know what to expect in 2011. 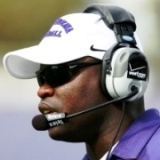 In a decisive move, defensive coordinator Brian Mitchell lobbied his boss, Ruffin McNeill, to make a philosophical defensive shift from the 4-3 to the 3-4 scheme. The aim was to create depth where there was none (defensive line) and to put the biggest defense burden on those with better athletic skillsets — the linebackers. The switch was made and, despite a line-up that featured just three seniors, the defense made dramatic improvements to finish last season ranked in the mid-50s in total defense. More importantly, the unit reversed every negative statistic from the previous campaign. Now with another year of experience, the East Carolina defense appears poised to make a run at becoming one of the better ones around. With key leaders in each component of the unit — Michael Brooks on the defensive line, Jeremy Grove at linebacker, and Damon Magazu in the secondary — the outlook for 2012 makes 2010 seem like eons ago. Bonesville (BV): Hi, Brian. Hope you have had a bit of a chance to unwind over the holidays and get ready for 2012. Brian Mitchell (BM): I would have liked to have been in a bowl game… that wasn’t a good feeling not having a bowl game this year, but I did get a few days. But I am excited about getting back in and continuing the process with these guys (heading into spring 2012). BV: Looking back at last season, you still had some serious injuries to deal with, but not like 2010. The statistical improvement was nothing short of dramatic. Looking beyond the statistics, can you tell me your first impressions of how the defense played in 2011? BM: What I saw last season is twofold. Number one, our kids learned how to work. Going into spring football (2011) and fall camp, there were some things we wanted to see. One was deliberate work and what I mean by deliberate work is to throw at them things that they do not feel comfortable with to learn how to outwork your opponent every day we step out there. So, our kids learned how to work. They took what they experienced in the (previous) fall (2010) and said, ‘Hey, we can be better than what we showed out there… than what we saw on the film.’ So our kids went into the weight room and went into the off-season with the mindset that we were going to learn how to work. And the second part of it was that we put them in a scheme that features their talents. We were able to go out and acquire the knowledge and implement a system that allowed the same exact kids that we played with the year before and gave them a competitive advantage that allowed them to succeed. BV: You mention the system switch to 3-4. How much of the success goes to the reps that the kids got in 2010 and how much do you think goes to the new system? BM: I think we took a group of kids — you go back to two years ago and a lot of the kids (the season before) were graduating or no longer part of the program — the learning curve was tremendous and very difficult for us to get a handle on it. The majority of the kids we had were basically playing high school football the year before or had never stepped on the field in a competitive, D-1 football environment. We were not only having them make adjustments schematically, we were also having to make adjustments mentally. There were a lot of times where these kids would hit the wall and they didn’t have an understanding of how to react to situations. I think that maturity (gained in 2010) allowed us to switch over to the 3-4 this season. We were low on D-linemen — no ifs, ands, or buts about that — and we were playing with guys who were undersized for that position and unable to finish and make plays in certain situations. But by putting them in the 3-4, we weren’t relying on those guys as heavily as we did in the 4-3 to stop the run and create a pass rush and do things of that nature. BV: You see the linebacker production last season just go through the rough. Does it reveal how much better the defensive line functioned in the 3-4? BM: Well, it goes hand-in-hand. Everything has to be in perfect alignment for linebackers, the secondary and the D-linemen to excel in this scheme. But what we are asking them to do is attainable. It is not something that is going to be a reach for each man’s talent. Those D-lineman did a great job of occupying four and five offensive linemen to get those linebackers an opportunity to run down hill. It is a gapped up defense down inside which allows your linebackers to run more freely. And then, athletically, our linebackers last year were some of our better athletes on this team. They were also some of our headiest players as far as football IQs, so those kids understood the scheme and where things fit. And, of course, the repetitions… doing it over and over and over again knowing, for example, exactly where the nose tackle is going to be on a given situation. This benefited our kids tremendously and we didn’t deviate from that one bit. That repetition allowed these kids to see several plays over and over again, but also allowed them to anticipate which plays were going for various situations. BV: Looking at the stats, across the board… every indicator is dramatically improved. Did you anticipate that drastic of an improvement? BM: It was really an unknown. We knew what we had — a bunch of kids who wanted to work and to prove what happened the year before was not their character, their demeanor, their ability and our coaches were the same way. You go into a year and you are saying you can hang your hat on “this” or you can hang your hat on “that”… Well, we hung our hat on the fact that our kids are going to work. It doesn’t matter what scheme you are in, as long as they are working… running to the ball… being aggressive and violent within the play calling. We knew that we would do some good things if that happened. Did we know that a Jeremy Grove or a Daniel Drake would step up like they did? We didn’t know that. We didn’t have a blueprint to go off of other than what they did in spring. For these kids to have some success within a scheme that isn’t even a year old yet, I think speaks volumes to them and to our coaches. You know Coach (John) Wiley, Coach (Marc) Yellock, Coach (Duane) Price and our other assistants… they did a great job of buying in and wanting to say, ‘Hey, we are part of this football team, we can all contribute.” And it all started with work… with getting in the weight room, film study, so forth. BV: Did you stay in the booth all season? If yes, what does it do for you that you couldn’t get done down on the field the year before? BM: I did stay in the booth all year long. You know, looking at the dynamics of our staff, I thought it would be best if I were to go up and to put Coach Wiley down on the football field. From staff dynamic… I have been up in the box most of my coaching career. I see things from a different perspective up there. I adjust differently when I am up in the box than when I am on the football field. The communication between myself, Coach Wiley and Coach Yellock, I think has improved and we were able to make adjustments better. The calmness of being up in the box and being able to flow much easier is why I stay up in the box. BV: With a young secondary, will you be able to do the same in 2012? BM: We will see how it goes this year. I think if the kids prepare throughout the week like they should, I will stay in the box. I know that there will be three new starters in there with (Damon) Magazu, but I feel that Magz can lead and direct and get everyone on the same page out there on the football field… and make adjustments. I think that the one thing we had a big jump in was football IQ and knowing things that were going to happen before they happened. And those four kids we had back there (in 2011) were able to push each other and be on the same page. I think Coach Wiley and Coach Yellock will do a great job of making adjustments there because we don’t do a game plan with just my inputs… it is a collective effort and every coach has input. The adjustments that we will be making with the defensive line, linebackers and secondary are known well by everyone in that meeting room. BV: Obviously, things went much better for the defense, but was there anything that you were disappointed in or wish you could have over? BM: You know, I would like to get the run game down to more like 130-125 yards (allowed) a game, but to see a 50-yard drop… that is tremendous. You don’t see a drastic change from last in the country where we were to the mid-50s in total defense overnight. I think as we progress in this defense as a coaching staff and as a unit, we are going to come up with other ways to attack an offense and create more unpredictability in how we go about our business. At this point, the only thing that disappoints me is the thought that there may be a single play out there that stopped us from going to a bowl game this year. I have not gone back and evaluated every game like we will when we get back from recruiting, but that is something that sticks in my mind. Did we give up the long run like a Marshall or the long pass on first down that cost us (the bowl)? I don’t know, but that is where I might be disappointed. BV: Last question on last season. So, you see Lincoln (Riley) kind of going through the same nightmare you went through in 2010 with all the injuries. Did you console him at all last season? Share any lessons learned, one coordinator to the other? BM: I didn’t give him any pep talks or anything, but the one thing that does come to mind is the fact that you are the same coach you were when you were breaking all of those ECU records a year ago, so I would say, 'Don’t change the way you go about doing what you do.’ You just have to keep figuring out what your kids can do and what they can handle and that is the only advice I would give Lincoln. I am the still the same coach who won 14 games and had one of the top secondaries in the Big 12 for four years back at BYU… so, yeah, don’t change what you are doing and what you believe in. Go from there. BV: So, let’s turn to 2012 and spring ball coming up. Can you give me your assessment of the work that Michael Brooks did and the two young ends, Matt Milner and Derrell Johnson, did for the team up on the defensive line? BM: Sure. You know what… they were the anchor… the first line defense for our defense. You talk about Lee Pegues, Matt Milner, Derrell Johnson and those guys were outstanding week-in and week-out. Look at Michael and Terry Williams — who doesn’t fit the typical profile — but had a great year for us as a backup at nose. He and Michael were as dominant at nose tackle as you will see in this conference. I am very excited about having both of them back this season there in the middle. Matt, Lee, Derrell are cat-like quick at the 4-technique. They are not the traditional 6-5, 280-90 pound guys who are just wallsitters. They are athletic enough to come off blocks and make tackles in the backfield and use athleticism for sacks. I was very pleased with the production of our front knowing that we lost some very key players in Leroy Vick and John Lattimore there with injuries in the spring and summer. BV: So you are feeling pretty good about the depth in the spring? BM: The one thing that you talk about in this scheme is the collective. It is not an individual, it is the collective. That is why you don’t have all these big numbers — other than (Jeremy) Grove and (Daniel) Drake at the Mike positions — because if you look at the collective, when everyone is in alignment, ALL of them are productive. It is not going to be flashy but you have every guy in their working and producing. But, up front, I am feeling really good about the experience that our kids have gained over the last couple of years and the way they are working. When you have a nice stable of guys like John Lattimore, Leroy Vick and Jonathon White, Terrell Stanley, Jeton Beavers… guys that are just as athletic as the guys you are playing with… you add that group to the mix, the competitive beast that is going to come out of each of them is going to take the whole group to a higher level. Another guy I am looking forward to having a great few years here is Crishon Rose who is in that group, too. We also moved Justin Dixon back down to the defensive line. At 265 pounds he is going to be a force in there at the 4-technique. We are going to get him honed in at that position. I think coming off the knee injury, you know, I think you never have a knee heal in one year and I think not having a spring slowed his progression more than anything. He is going to be a great third-down specialist for us and we are going to find a way to feature his talents on this defense because he has great talent. I think we are going to go three-deep and I am talking about three-deep in production not bodies. I think the guys in that three-deep will play and there might even be a rotation where each guys is only playing 20-25 snaps a game because each of them are equally productive. BV: Understand that Vick is getting huge. Will he be inside only? BM: We have options with Vick… but you know that is one of the great things about how we have implemented the 3-4 here. Really, the nose is really not playing any different than those guys in the 4-technique so, really, all of these guys are virtually interchangeable, allowing you to put your best three guys out there for the right situation whether that be a scenario where you have Lattimore, Brooks, and Vick all out there at one time or another group. You still don’t lose the integrity of the defense and that is the beauty of what we have done here with the 3-4 defense. As long as they are productive, gap-sound and make plays, why not get different combinations out there for different situations? Why not, if say we are playing a running team, get three 300-pounders out there that are still cat-quick and can rush the passer but also be damn stout against the run? BV: Moving on to the linebacking corps, when we last sat down like this, you had made a point to underscore how excited and pleased you were with the spring camp and summer efforts of Jeremy Grove. In fact, you cited him as having had the best camp of all the backers. Did his output surprise you? BM: I think with Jeremy, his success is based on three things. When you sit down and talk to the kids, the first thing you want to know... if that kid loves the game. Does he love to play football, does he love film study, does he love to get in the weight room, does he love the physical aspects of this game? Jeremy Grove fits all those criteria and then you add the intangibles that he has which I have not been around in a player for some time with the intangibles he brings. He has natural ability that is innate and somehow just knows how to bend, twist, slip through, to make the tackle and he is the epitome — one of those pillars you want to build your defense around. And what’s great, is that he is going to be here for three more years. And, you know, he is also great off the field. BV: When we last talked you also had put Ty Holmes up there as well in regards to ready for prime time. He was not the fixture in the defense that Jeremy was. Is Ty still pushing up the depth chart? BM: Well… I felt Ty throughout the year showed improvement and he did some really good things this season. His problem was that he had a freshman All-American playing in front of him that didn’t want to leave the field… that was his “problem.” We’re not going to take a kid of that caliber off the field if he is healthy, productive and making plays and doesn’t need a rest… like Grove did. I think Ty is a very versatile player who we used some at other positions and who played very well on third down — as we used him in the last game because of injury. Given an opportunity, he will excel. BV: Looking at the other Mike linebacker, Daniel Drake, can you share some thoughts on a guy who seemingly came out of left field to be a starter at Mike? BM: First off, Daniel Drake was probably the most integral part — early on, particularly — of this defense as any player out there. For a guy who was 5th or 6th on the depth chart coming of out spring, becoming a starter versus South Carolina and being one of the nation’s leading tacklers most of the year, I can’t say enough about his desire and commitment to this team and Coach Wiley’s coaching. Daniel had such an inner desire to not let his teammates down that just spread to the whole team. He battled week-in and week-out knowing he didn’t have anyone behind him besides another walk-on. He fought through a lot to be on that football field, not letting a nagging injury and an often-times debilitating condition sideline him and keep him from what he loves to do on that field. When you have competition at a position, it makes everyone much better and so you look at Kyle Tudor there knowing he has Daniel there in front of him, had to come back (from his injury) — not that he didn’t have the mentality of a warrior because he does — but having Daniel there in front of him elevated Kyle’s will and want to go out and be productive. And having that front in there, it allowed our linebackers to be the players they should be. But, they have to be good tacklers and that is what they all did all year long. Kyle has the boxer mentality in the 15th round — 'You’re not going to knock me down… I am going to win this fight.' — based off shear energy and commitment and love of the game. Those two make each other better. They are equal in play-making ability. They will likely split time. BV: Looking at the outside positions, it seemed like Chris Baker — the JUCO — came in and really locked in and then Marke Powell seemed to be very active and consistent as well. Talk about the outside guys some. BM: At our Will backer we have Chris Baker, Jake Geary and Maurice Falls — all three of those guys played a key role at that position at some point in time during the season. Having Chris come back for his senior season with more experience and getting away from some of the junior college ways, he is going to be a bigger and more athletic player now with a year in the program, and then Jake — he is exactly what you want your program to be. That kid is so unassuming, a hard worker and when you put him on the field he is so animated and so productive and does everything the right way. He’s a blue collar guy and that is the type I want around me. Not that talented guys who run a 4.3 and jump out the gym aren’t what we want… that is eventually where we are going to get to here, but we want the athlete that wants to outwork his opponent week in and week out and Jake Geary — as a redshirt freshman — is one of those guys who within this scheme was able to finish and make plays, be assignment sound, and give great effort. And if you can do those things, you can very productive in this system. It is not magic that they were productive. The scheme allows them to be productive down after down. I am excited about those three guys. Maurice is a guy who played his first football this year and was very productive for us, especially on third down rushing the passer, and he is versatile enough for us that he was able to go over and play some Sam backer for us. He gives us versatility, size, speed… looking forward to seeing how much he matures this spring because he made a big jump toward the latter part of the season. BV: How about on the field side, the Sam position? BM: To our Sams… of course Marke Powell has been a fixture in the program for three years. He is a very athletic young man that is going to be a senior. I think we are going to need more leadership out of Marke and I think he is willing to do that. I tell you what, when that kid is out there, he gives you everything he’s got. He is spent after practice. You never see him take a play off. I think having this year under his belt… learning to play on two feet since he has always been a defensive end here — I think that learning curve has gotten shorter and I think he is going to have a breakout year this year. Behind him is a young man named Montese Overton who was redshirted last year. He is one of the fastest kids on our team and a very dynamic athlete… very tuned in to what we are doing. He is going to give us a different look out there on the field with his speed and athleticism. Whereas we were playing mostly zone with those other guys, we might play more man-to-man and blitz him a little more because I think he will be great off the edge. BV: Looking at the unit that is probably closest to your heart, the defensive backs, you lose not only three starters but arguably the best corner in the league and a pretty darn good safety as well. Talk about some of the young guys you are expecting to step up and hopefully build around Magazu back there. BM: I think that there is going to be a great battle out there with Jacobi Jenkins and we signed a kid in December in Adonis Armstrong… he’s a kid who had 7-plus interceptions and 5 touchdowns — whether they be interception returns or kick returns — he will come in and battle hard. And of course, we have some kids coming in and we can talk about them once they are all signed. But, Jacobi he has been like a son to me. Every success he has, I can do nothing but say, 'Well done.' You know, for that kid him to come in here and he didn’t have corner skills, but he had corner ability, and to play the way he did last season speaks volumes for him. Having another spring under his belt and learning more about the position and having some of those skills become innate… I think he will vie for the starting position out at field corner. He will work hard… he just does and that is sort of what I am saying about a lot of our players… they just work so hard. They know how to go about their business without coming up with excuses and Jacobi has that mentality. He will be in the rotation if not the starter. When we get Adonis in here we’ll determine which side he is best suited for. If we get the players we need in here through our recruiting, I think we will be playing more like 8 guys back there and maybe play a little more than just nickel on third down and have more than just depth, but quality depth. Guys like last season where we had Leonard Paulk ready to step in for Emanuel Davis at South Carolina. Tremendous help to us last year when ED couldn’t play and he was very productive, sound in his assignments, great in tackling, gave us a physical presence on the football field when ED was not out there. Leonard contributed in a way that shows that the kid understands, he’s blossomed, he’s arrived and I think this kid is going to have a great year this fall, I really do. He is one of our best athletes on the team with a great mentality day-in and day-out, great off the field, great worker. He is a very excited player out there. BV: You talked about Paulk on the boundary and your expectations for him and that you expect to get some immediate help should we sign who we expect to sign in February, but can you speak to some of the guys currently in the program who might be able to challenge at corner in the spring? BM: It is all predicated on recruiting, but I think that Rocco Scarfone is a young man who can play inside or outside or field corner or boundary corner. He is cut from the same cloth as Magz and Jacobi… he wants to do whatever the team needs him to do to help. Rocco has great speed, great instincts, high football IQ. I am looking forward to working with Rocco. I am looking forward to working with Detric Allen as well. I want to see how he has matured in this second spring camp. He has a great body on him, he has a great understanding of what we are doing schematically and does everything he is asked to do. Let’s see if that fire is going to be lit underneath him since he didn’t play corner in high school… to see if he is developing those intangibles that will allow him to be more consistent. I feel good about those two young players. We have another young man, Kris Sykes, who is such a great story. Last year, he was a young man who played his first college football as a junior and I tell you what, you talk about a kid who is a go-getter, a good athlete… wants to be here, wants to do whatever it takes to help this team win — that is Kris. The production he gave us last year at nickel was his first introduction to football and he did a really good job at nickel for us, so he will have an opportunity to compete for one of those corner spots. BV: You talked about Magz and building around him, but who else are you expecting to be in the mix at safety this year? Can Desi (Brown) or Lamar (Ivey) step in to a full-time job this year? BM: I think everyone knows that Magz is Magz. He is the rock, the foundation of everything we do back there. He will call our signals and get everyone lined up. But, you know, I thought that Justin Venable did a good job of giving Magz a spell every once in awhile and will be a solid backup. Lamar and Desi, I think they are two young players who are like sponges. I thought Lamar at the beginning of the year was going to be pushing Bradley Jacobs for the position but he just hit the brick wall like most young players do and his learning curve kind of stopped. He is very talented, very heady, he is a young man that if he learns how to continue to work at a high level — not just status quo — he will be a young man that with his athletic ability and football IQ can be a very dominant football player. Desi sort of had an opposite experience last season. I thought early on he was like a deer in the headlights. The one great thing about Desi, last year, was that Brad had classes two days a week that had him away from practice time, so Desi got reps every day and he gradually improved to the point where in the last few games, I thought he was going to get in the games. I am excited about Desi because he gives you a big, physical body over there and when you put him or Lamar next to Magz back there, we have two very good safeties on the field. Godfrey Thompson is a hybrid type guy at 6-0, 200 pounds and will probably be one of the faster guys on this team and will give us versatility back there. I am looking for him to come in and have great impact for us. You don’t sign those JC guys not to come in and compete right away and contribute. I think he is a quiet guy who can lead, and on the field he is a very, very violent player who I am looking forward to showcasing some of his talents this year. BV: As far as recruiting, share your thoughts on how recruiting is going? BM: I think it is going great. You need a mixture of old and new talent and that is why we are going after a couple of JCs in the secondary. You need mature guys to help bridge the gap between the Roccos and Detrics and some of the younger guys who are coming in, in case they are not ready mentally. Last year, we had some guys who could have helped us, but mentally they were not prepared to go through a season and the redshirt benefited them. This recruiting class, we are doing a good job with the junior college guys we are bringing in and there might be one or two freshman who can step in, learn the scheme and handle the off-field responsibilities in a way that will allow them to be players on the football field. We take each one case-by-case based on maturity and capacity to succeed. BV: With so much of the young talent emerging, do you approach things differently this season? BM: The classes are spread out to the point where we are building the foundation. Like in 2010, I am looking at the board and a lot of these guys played in 2010 with very little senior and junior leadership, but now you look and it is juniors and sophomores with a few seniors sprinkled in, but the core is our freshman and sophomores. Once the system is in place, the way we think schematically, we are plugging guys in year after year. We play 22-25 guys each week, so year-in and year-out we are building experience which is sort of what happened with a guy like Lee Pegues and Derrell Johnson, Matt Milner, and Terry Williams. If you have the competition you are not making wholesale changes in any given year. BV: All the coaches were excited with the progress (strength and conditioning coach) Jeff Connors had in half a year on the players. What are your thoughts about a full year with Coach Connors? I think with them buying in and being around our way of doing things speaks volumes for them. I think there will be an even bigger jump strength-wise for our program. We benefited mostly from our lower body explosiveness and lateral quickness last year and of course injury prevention was a key benefit to this program. Our kids did not slow down — we played fast for four quarters… 60 minutes... and that is conditioning. Jeff has been and will be critical for us.